The center portion of the design was inspired by a small black and white drawing in a design book. Karen Kay often starts large quilts in the middle of a Pennsylvania winter, when she is thinking longingly of the colors of the Caribbean. 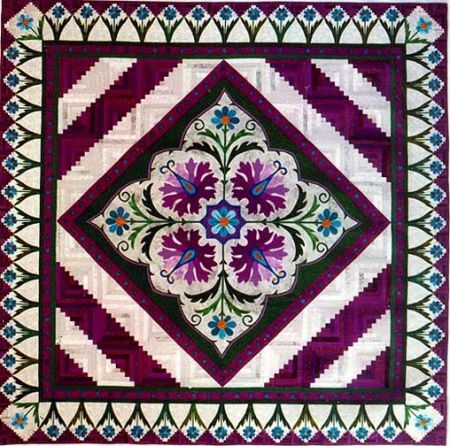 She used many three-dimensional techniques on her quilt, including pleating, ruching, gathered flowers, and beading. She says, "The border design was the hardest. I left the quilt up for quite a while until I could decide what to do." Caribbean Floral Fantasy was awarded a second place at the Lancaster Quilt Celebration and a third place at the annual National Quilting Association, Inc., show. Caribbean Floral Fantasy appeared on the April 1997 cover of Quilter's Newsletter Magazine.